1Password promises to do away with the need to remember passwords, with automatic logging in and other advanced features. Its easy to use and well priced for what it offers. If you want to save your dozens of online passwords, generate new ones, and log into sites with a simple click, then 1Password is the best way you can do it. This is a fantastic password manager that’s blissfully simple to use. 1Password, developed by AgileBits, is a popular password manager that began life as a Mac program. It’s now available across Windows, Mac, iOS, and Android. After testing this password manager, we’re happy to say its reputation is well deserved. 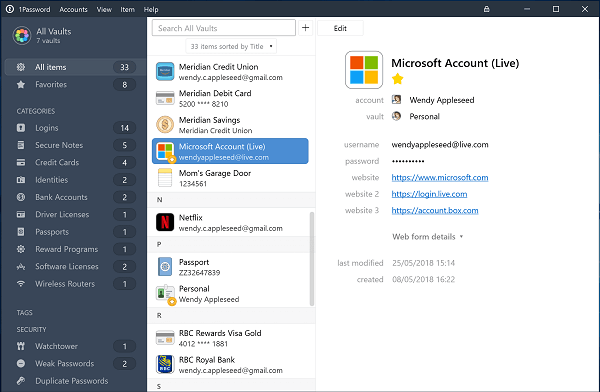 1Password isn’t without the odd drawback, but it’s easily one of the best password managers we’ve tried, and it’s even better than rivals such as LastPass or Dashlane. 1Password can generate safe and secure passwords for you, and store all manner of sensitive information in a secure format. Credit card numbers, documents, bank accounts, driver’s licenses, passports, social security numbers — you name it, 1Password can store it in your encrypted vault. In terms of day-to-day use, 1Password is very well designed. The software is easy to understand and doesn’t require you to learn the app’s own peculiar logic. It’s logically organized and is smart enough to instantly provide your passwords when you need them via the 1Password browser extensions. In the table below, we compare 1Password to its main competitors in the password manager space – including market leader, LastPass. As you can see, we think 1Password has the edge, based on our thorough testing. 1Password is very easy to use, and its design is beautiful by the standards of such software. Rivals such as Dashlane and LastPass are far more utilitarian in layout. 1Password manages to perform its key tasks in an attractive and easily navigable package. That goes for 1Password’s desktop program, the mini app that comes with it, the mobile app, and the browser extension. All of them have a similar design, making it second nature to navigate each one. If you want to see how 1Password stacks up against every other password manager we’ve tested, check out our comparison page. When you want to use a stored password, all you have to do is visit that website, then click on the 1Password browser extension, or the 1Password icon that appears in the login entry box. You’ll see all the account logins in your vault that are available for that site. To log in, you can either click on the entry you want and let 1Password log you in automatically, or you can right-click and copy the username and password to log in manually. The browser extension is mostly for using your information as you need it, though it can also generate new passwords if you’re signing up for a new online account or updating an old one. However, if you need to store further data, such as a credit card or important document, then you’ll need the full desktop program or the mobile app. 1Password lets you store more than just passwords. It can safely encrypt data such as your passport information, driver’s license, reward program account numbers, your social security number, wireless router passwords, software licenses, and more. It’s clear that AgileBits sees 1Password as more than just a repository of your logins and credit card numbers, letting you store your entire digital life under one roof. There’s even an option for importing files and documents. 1Password can also manage multiple identities and multiple vaults. If you want to keep your work and personal information separate, 1Password can do that with differing vaults. New vaults can’t be created in the app, however – you’ll have to do this on the 1Password website under the account management section. Creating a new password or changing an old one is pretty straightforward. If you land on a site where you need a password click the browser extension, and the click the key icon with a plus sign (it’s towards the bottom). You’ll then be led through the process. If you want to update your password, for most sites you follow the same process to generate a new password and then 1Password will detect the change and offer to update your vault. Under the 1Password vault, there are three tabs: Categories, Tags, and Security. Click on Security and you’ll see an option called Watchtower. This section reports on any websites in your vault affected by serious breaches and security vulnerabilities. 1Password is the best password manager we’ve tested. While it has the odd drawback, these are minor complaints rather than serious issues. If there’s one downside to 1Password, it’s that it can get a little confusing about which app you’re supposed to use. Essentially, you have three choices: the browser extension, mini app, or the full desktop app. For most uses, the browser extension is really all you need – it’ll certainly be a familiar setup if, say, you’ve used LastPass previously. Only when you need to take a deeper dive into creating secure notes or encrypting extra data, such as your passport details, will you require the full desktop app. It’s a wonder AgileBits couldn’t have folded everything into the browser extension and done away with the desktop app entirely. When asked about this drawback, 1Password said it’s working on a browser-centric solution called 1Password X. Currently in beta, 1Password X is meant to be a full-featured version of 1Password that exists only in the browser. 1Password X isn’t a finished product yet, but it’s off to a good start including the ability to view your secure notes within the browser – something the regular extension presently lacks. It would be good to see 1Password make the Watchtower feature into a more robust security analysis. Ideally, this should let you see which of your accounts have duplicate passwords, for example, as well as a look at which passwords are weak and more susceptible to hacks. Both LastPass and Dashlane have a feature like this. Finally, it would be great to see 1Password’s mobile app add the ability to snap photos with your device camera. That way you could, for example, upload a snapshot of your driver’s license, in addition to manually entering the information. There’s no free version of 1Password (beyond the initial 30-day trial). But, we feel this is a tool that’s well worth paying for. For individual users, 1Password subscriptions start at around $36 per year. Families that want to use the program for up to five users can get it for $60 per year. For business users, there are three tiers. The Teams product is priced at $3.99 per month per user, and entitles users to unlimited shared vaults and item storage, administration controls, 1GB document storage per user, and five guest accounts for limited sharing. The next step up is 1Password Business that costs $7.99 per user per month. You get the same administration controls and unlimited shared vaults and item storage, but you also get 5GB of document storage per person, 20 guest accounts, activity logs, usage reports, and a variety of enhanced administration controls, including Active Directory provisioning. Finally, there’s the Enterprise plan, which adds a dedicated account manager to the business tier, set-up training, and an onboard engineer. 1Password offers custom quotes for Enterprise instead of pre-set prices. 1Password’s sign-up process is a little more involved than with other password managers. Usually, you sign-up with an email address, pick a master password, and you’re off to the races. While you still need to come up with a master password (the only one you’ll need to remember) and supply an email address, 1Password adds a few more steps. These all happen on the service’s website. First, you sign-up for the 30-day free trial and supply your email address. Then, you click an email verification link and continue creating your account. Next up, it’s time to add your name and an optional credit card number. Unlike its competitors, 1Password does not offer a free tier – if you want to use 1Password, you have to pay for it. Adding a credit card when getting started allows your service to continue seamlessly after the free trial is over. Next we get to the master password stage. This is probably the most important step for any password manager. The master password is the key that unlocks your password vault, so you want to use something strong and memorable. 1Password doesn’t offer any tips for creating a master password. What it does have, however, is a generator that creates a master password for you. 1Password uses the current best-practice recommendations of creating passwords using a collection of memorable (yet random) words. The master password generator lets you create a passphrase with a minimum of three words, and you can also choose whether to separate those words with a variety of special characters – hyphens, commas, periods, underscores, and so on. If you use the password generator, 1Password gives you an opportunity to type in your new password several times in order to remember it. 1Password gives you something that many other password managers don’t: a secret key. This is a secondary code that you’ll need whenever you sign in on a new device. This, and the master password, form the two bits of information used to safely encrypt your data. There’s a further backup, too, in case you forget your secret key. 1Password supplies you with an “emergency kit” PDF with most the information you need to sign in – you’ll need to write in the master password yourself. The only thing you’ll need to do is put that PDF somewhere secure like an encrypted USB drive, or a safe spot in paper format. The emergency kit also doubles as a method for a trusted family member to get access to your logins should you become incapacitated by illness. Make sure someone you trust also knows where this emergency kit is stored and how to use it. As the final step towards creating your 1Password account, you land on a web page where you have to enter your email, key, and master password. Luckily, 1Password autofills the first two items for you. 1Password is a fantastic choice for storing and managing your passwords. It’s very easy to use, and it has pretty much everything you need in a password manager. The pricing is pretty good, too – while it’s a little more expensive than LastPass, it’s a bit cheaper than Dashlane. While there’s no free option with 1Password, if you are willing to pay for a password manager then 1Password is easily one of the best choices you can make.